With Christmas officially less than a week away, I figured it was high time for some Christmas nail art! So with a little help from the straight nail vinyls from NailVinyls.com and a pair of Milani Color Statement shades, I whipped up some candy cane nails! For this manicure, I used Milani Iconic Red and Spotlight White. 1. Paint the white for your base color and apply the red over the nail vinyls. I made the mistake of painting red as my base and it was a lot of work getting the white opaque. So save yourself the hassle and don't do it! 2. When using nail vinyl lines or striping tape, paint in the direction of the pieces. I achieved FAR cleaner lines when I applied the polish on a diagonal than when I just applied the polish in a vertical line from bottom to top. 3. Wait at least 20 minutes for the polish to dry before applying a top coat. I know that seems like a long time and the Milani Quick Dry top coat is amazing, but your colors WILL smear if you don't wait at least that long. Seriously. Hold out as long as you can. Nothing is more aggravating than having beautiful stripes and screwing it up after such hard work. 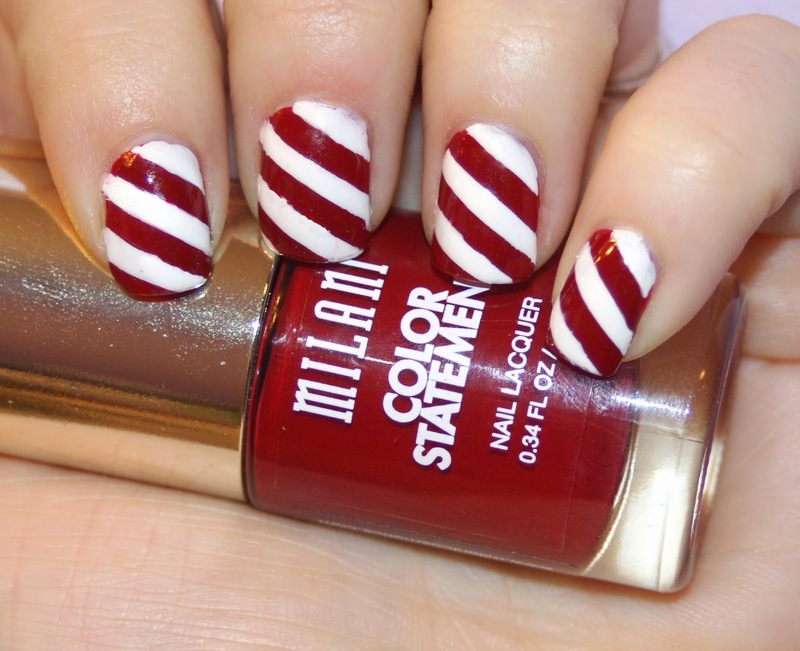 Feel free to post your Candy Cane nails to the Princess Polish Facebook page to show them off!